Eve is a mysterious character appearing in the Yu-Gi-Oh! 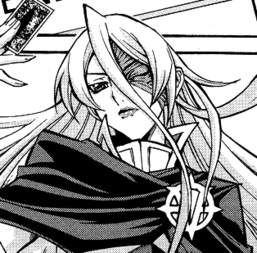 ARC-V manga, serving as the manga's main antagonist. She wields the powerful "Genesis Omega Dragon". Eve appears as a tall fair-skinned young woman, though she is far older than her physical age. She has long blonde hair that extends to her waist, which she uses to cover the left side of her face, which is badly discolored down to the cheek as a consequence of using the power of Genesis Omega Dragon. 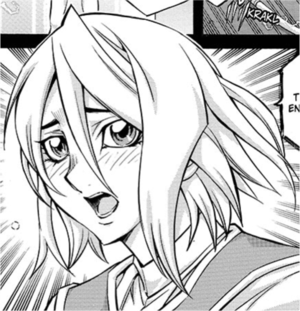 He left eye is almost constantly closed and her left eyebrow has fallen out, but this eye is revealed to be blank during her Duel with Yuya; her right eye is green. Eve wears a long black mantle over a sleeveless white jumpsuit patterned in a similar manner to armor with a high collar, and boots of the same color with thick black heels and soles. The "V" symbol in the title of Yu-Gi-Oh! ARC-V appears prominently in her design; the chest and navel of her jumpsuit both feature it in black and green, as does the clasp of her mantle. 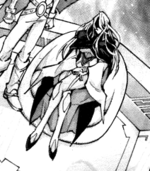 After she Summons "Genesis Omega Dragon" during her Duel with Yuya, the discoloration expands to cover her entire body and her clothing is destroyed. Her eyes become dark pits, and her torso merges with the G.O.D. 's head. When she was younger, Eve's hair was shorter, reaching down to her shoulders with a bang between her eyes. She wore the uniform of her university; a long cape with a clasp similar to that of a Duel Academy jacket over light clothing. In the Hebrew Bible, Eve was the first woman, who lived in paradise, the Garden of Eden, together with Adam. Originating from a distant future, Eve is the lover of the scientist Adam and shared his desire to make the world a better place. But dabbling in the unknown energies they uncovered created Genesis Omega Dragon, with Adam sacrificing himself by absorbing most of the energy with his soul scattered across time and space. Rendered an ageless being by the weakened G.O.D. card, Eve became a thrall to its will as she seeks the scattered essence of her lover: Adam Factor. In her travels, Eve recruited Ren after the G.O.D. card gave him a second chance at life. Eve was first seen at an unknown place watching Sora's Duel with "Phantom" alongside Ren. Once the Duel ended, Eve requested Ren to retrieve Sora, as well as to search Yuya's memories, to which Ren abode. Later, when Yuya and Reiji Akaba Dueled, Eve and Ren watched their Duel in order to find out whether Reiji possessed the Adam Factor as well or not. Upon the end of the Duel, Ren revealed that their true objective was to truly awaken the Genesis Omega Dragon card, which Eve was shown to currently possess. Eve was later revealed to be deathly ill, attended to by her physician and oldest companion Isaac. While being tended to, Eve's goal to use G.O.D's power to restore the memories she, Ren and Sora had lost of their former lives along with immortality at any cost was revealed. Not much is known of Eve's relationship with Adam save that it was founded on love and mutual vision of the world in peace through beneficial science. When Adam first used the G.O.D card, Eve was concerned for her lover before he sacrifice himself to prevent a disaster. With Ren noting she is chasing a dream, Eve is motivated in seeking those who possess the Adam Factor to restore Adam. Originating from the same time period, Isaac is one of Eve's oldest supporters and shares her desire to restore Adam. Eve uses a "Mystic" Deck, using Pendulum Summons to summon multiple monsters so that they can used as material for Fusion, Synchro and Xyz Monsters. She describes her Deck as an ultimate Deck that only she can control due to her time spent crossing time and space; her Fusion, Synchro, and Xyz Monsters all reference "legend-class Duel Monsters" that were used by previous antagonists from the various anime and manga series. ↑ 1.0 1.1 Yu-Gi-Oh! ARC-V Scale 18: "An Unknown Enemy!" ↑ Yu-Gi-Oh! ARC-V Scale 37: "The Cause of Everything!!" ↑ 3.0 3.1 Yu-Gi-Oh! ARC-V Scale 25: "Adam and Eve!"